Drought-forced supply pressure is starting to show up in pricing for northern cattle, with big areas facing critical turnoff decisions in coming weeks if rain is not received. The Barkly and Western Queensland are among the hot spots where feed and water shortages are now causing particular seasonal pressure, with reports that many properties in the region are now gearing up to start mustering in the next few weeks, much earlier than usual. This follows a light wet season for the Eastern Barkly and Western Queensland last year that left the region with limited grass reserves. Cattle weights across the north are also lower than normal, pointing to a likely increase in supply of feeder cattle onto the market in coming weeks if good rain is not received. 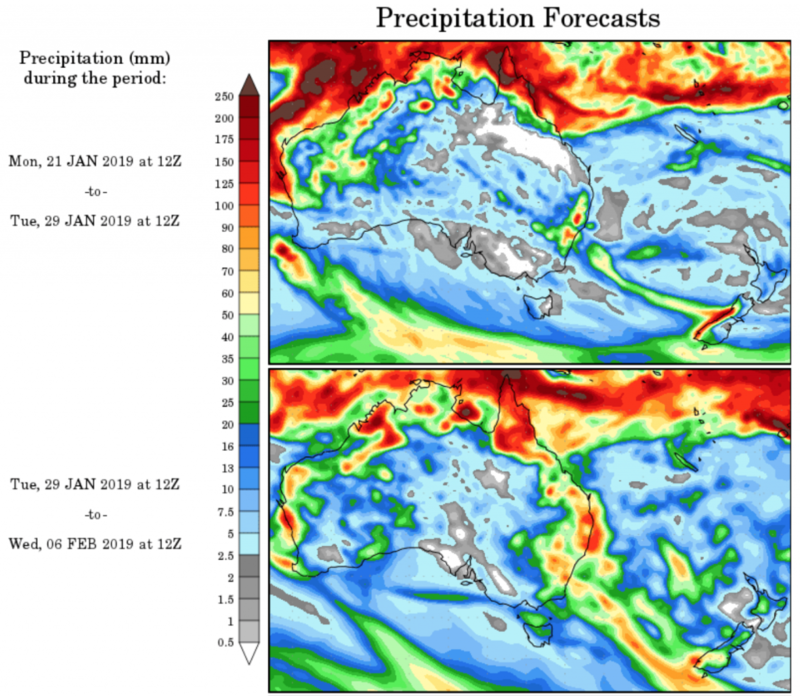 Relief is possible, with the latest 7-14 day forecast predicting some northern rainfall next week (see maps below), but on the balance of current conditions, the market appears to be already factoring in a pending increase in feeder cattle supply. 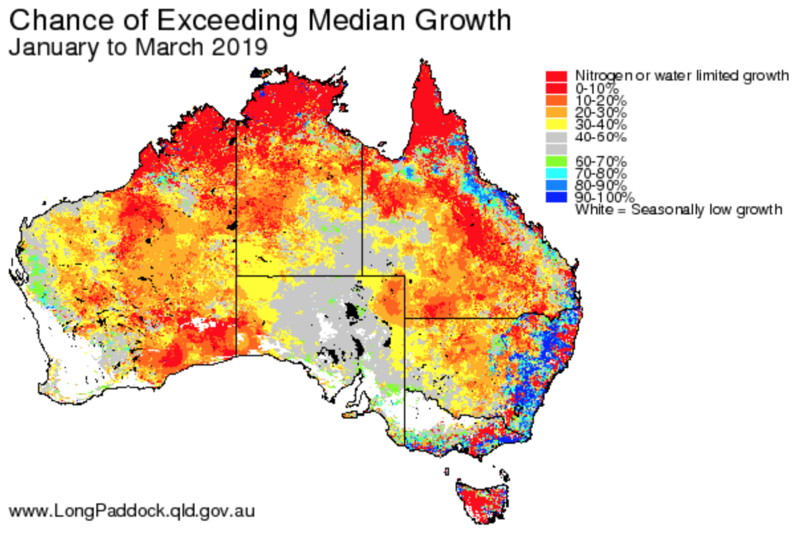 After rising to 335c/kg earlier this month, transacted prices for live export steers ex-Darwin have eased by about 5c/kg in the past seven day sand further downward pressure is likely widespread rain is not received across the central and eastern states of Australia. Consolidated Pastoral Company chief executive officer Troy Setter said cattle from western Queensland were increasing in volume towards Darwin, as well as continuing to supply continued shipments out of Townsville. If it didn’t rain soon in western Queensland or the eastern Barkly, whatever cattle were left in that area would be likely to come onto the market or find other properties soon, he said. Pasture growth seasonal probability for January to March 2019. Click on map to enlarge. While there were still some 340-380kg steers available in Queensland, generally speaking remaining cattle were not gaining as much weight as they usually do at this time of year. “The cattle around Katherine and north that usually get stockpiled this time of year are lighter than normal,” Mr Setter said. The current dynamics had created a split with heavier steers currently worth a premium in cents/kilogram terms to light steers. >Mr Setter has just returned from Indonesia where CPC owns and operates two cattle feedlots. He also attended a range of industry and government meetings including an informal Indonesia Australia Red Meat Partnership meeting, to which he and fellow pastoral company chief David Foote of Australian Country Choice were appointed in November last year. In contrast to more subdued reports about the current state of the Indonesian market and demand, Mr Setter said he felt conditions in the market were more upbeat. He said CPC’s own sales to Indonesia in 2018 had grown significantly, however he noted there was an easing of demand from some regions at the end of 2018 and into the start of 2019. “Demand for Australian beef and cattle is still there and overall things are going pretty well,” he said. There has been a little bit of economic adjustment due to challenges like exchange rates, terms of trade and families paying for their children to go back to school in January etc but there is still good demand and Indonesia remains a strong growing market. “The supermarkets and local markets I saw were selling good volumes of Australian and local beef for this time of year. “Indian Buffalo Meat is there, it is causing some challenged in some markets but I think what we’re seeing is a growth in the animal proteinconsumption pie and Indian Buffalo Meat is fitting into that. Another dramatic demonstration of our dependence on Live Export – and our potential to have to meet lower priced markets with lighter weight cattle. Even more: As well as their own turnoff from large scale drought areas of NT areas, AACo Livingstone Abattoir may prove a financially secure ‘service’ abattoir for slaughter/boning/packing large clients cattle – alternatively a buyer/packer/marketer of manufacturing product from excess numbers unable to travel the long distances to other Meatworks? Assuming of course it has been kept at a ‘turnkey’ readiness – which would make sense considering what it cost – as well as being in the environment AAco Northern properties have worked for so many long and sometimes dry years.